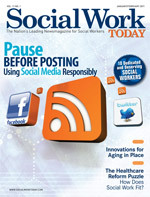 In anticipation of National Professional Social Work Month in March, we’re using this issue to excite and inspire you about the coming month that honors all social workers. We created the 10 Dedicated and Deserving Social Workers contest and asked readers to nominate their colleagues, coworkers, and mentors by writing essays about whom they believe should be recognized. We followed that up with personal phone interviews. With so many heartwarming stories of those dedicated to the field, it was hard to narrow it down, but we managed. Here are 10 social workers who deserve recognition for all they do. Thank you. When she was young, Neena Bixby thought she wanted to be a doctor—that is until she learned how much math was involved in becoming one. She ultimately wound up in a hospital setting, working at Huntington Hospital in Pasadena, CA, for 34 years before her recent retirement. Bixby was the hospital’s first master’s degree-level social worker for medical, surgical oncology, and critical care services. She then helped develop the cardiac rehabilitation and oncology social work programs and was dedicated to integrating social work into the inpatient setting, says Gladys Gundrum, special projects coordinator at Huntington Senior Care Network, a department of Huntington Hospital. “As a sought-after field instructor for graduate social work students from the University of Southern California, she also mentored students to be the best they could be,” adds Gundrum. Over the years, Bixby says she’s faced various challenges. Working with children, she says, can be difficult when people mistakenly believe social workers are welfare workers or are “out to take the kids away.” She says it’s important to make the effort to ensure clients know you’re on their side. Though she’s accomplished a lot, Bookman says one thing that has been a recurring problem over the years is politics and working with people who don’t want to cooperate. But she has been able to forge ahead by collaborating with other nonprofits and agencies. Today, Bookman has the same drive she had when she started in the field and says she’d tell current social work students to know that they really can save the world. Timothy Chamberlain says he’s always been drawn to human services and from a young age knew he wanted to help people. When he got on the social work track, the idea of working in a hospital setting fascinated him. Chamberlain worked his way through various jobs in social work, ultimately winding up at Stanford Hospital in California where he’s been a social worker in the ICU for 10 years. He has been honored by the hospital on numerous occasions as an employee of the month as well as the recipient of other awards. Working with the California Transplant Donor Network has been one of the most rewarding aspects of Chamberlain’s job. “Working with those families is just an incredible experience, and I’m a very strong advocate for organ donation,” he says. But Chamberlain says being a social worker in the medical field can often be trying. He’s been challenged by a lack of resources and says there have been times when he felt that only a Band-Aid is going on a case that needed much more attention. Outreach Clinical Social Worker at Elder Services of the Merrimack Valley, Inc.
Six years ago, Kimberlie Flowers’ life and career looked a lot different from how it looks today. That’s because she was working in corporate IT. But when her parents were both diagnosed with cancer and then in their early 60s passed away only a few years apart, it was a life-changing experience in many ways. “For one, it was my first real exposure to sickness and dealing with hospitals and medical insurance,” says Flowers. “I realized how difficult it was to navigate those systems. Flowers continued working full time while completing school. When she saw a job posting at Elder Services of the Merrimack Valley, Inc. (ESMV) in Lawrence, MA, she applied. “In my cover letter, I pretty much admitted that this career change might sound crazy, but I really wanted to do this,” she remembers. She ended up with a job, enrolled in an MSW program, and ultimately worked her way up through the company’s ranks. Flowers recently implemented an elder hoarding outreach program and has worked with Boston University on a research project studying the use of cognitive behavioral therapy and motivation interviewing with older adults who compulsively hoard. In addition to working with the hoarding program, Flowers is a master trainer for the Recognize! Connect! suicide prevention project funded by the Massachusetts Coalition for Suicide Prevention, through which she’s trained more than 200 individuals to recognize the warning signs and risk factors for suicide. Director of Social Work at Milwaukee Health Services, Inc.
Pat Higgins has dedicated her entire career to helping patients with serious mental illness. She started her social work career at Western State Hospital in Staunton, VA, in 1979 and has been there ever since. She’s currently the social work director. While Higgins says social work was the best career choice she could have made, in college she found herself wavering between psychology and social work. The deciding factor was a professor who made a lasting impression. “I had been undeclared at the time, and I realized this was a great way to get into the field and really help people, especially at the bachelor’s level,” she says. As a young gay man during the height of the AIDS crisis, Ken Howard says he couldn’t stand by and watch the tragedy of what was happening to his peers. He says that was his inspiration for a career that would ultimately lead him to social work. “I liken it to a young man enlisting in World War II—the feeling that you have to do something about it,” he says. Still, Howard wasn’t immediately drawn into social work. Initially he saw himself in a mental health field and earning a PhD. But not long after making this decision, he was diagnosed with AIDS. Today Howard is a 20-year survivor of AIDS and says he’s focused on being a sort of “psychiatric social worker, working with his peers—gay men living with AIDS.” Over the years, he’s also done a lot of work with the homeless. Howard is also a nine-year cancer survivor. His own battles and survival of major illness have given him a unique perspective with clients of his West Hollywood, CA, private practice. In addition to his private practice, Howard volunteers as a community speaker and nonprofit organization clinical director. He puts together regular newsletters, podcasts, and blog posts centered on self-empowerment. “I like to say that I try to ‘survive and thrive’ living with HIV and help others do the same,” he says. He tries to overcome lack of funding with his belief in turning to resources, something that most social workers emphasize. “I believe in the idea that for every challenge a client faces, there is a resource out there that can amend it,” he adds. For more than 30 years, Ray Liles has dedicated himself to the areas of mental health and children’s services. That interest was first sparked with a survey course in college as well as a personal experience Liles says he’ll never forget. Since that “a-ha moment,” Liles has worked his way through the field, focusing on mental health and child welfare. Though they are both areas he is very passionate about, Liles says it can be a challenge to have two separate areas of expertise. “Jumping back and forth between those two areas is a challenge, as it’s important to stay current in both fields,” he admits. The answer for Liles has simply been working hard, as he always has, like the days when he worked his way through college. Liles is a founding member and former coordinator of the Riverside Interagency Sexual Abuse Council, which is an interagency child sexual abuse treatment program launched in the mid-1970s. But Liles’ group proved otherwise, making the agency a catalyst for future changes. Liles believes it was also the first interagency group in the country in a time when agencies operated mostly on their own. That served as a model for future work. In addition, Liles is the first coordinator of the Children’s Network of San Bernardino County, another interagency group coordinating all children’s services on a countrywide basis. Liles has also taught courses at community college and conducted a variety of continuing education training opportunities for social workers on various social work practice subjects. Since that internship, Perry says she’s held various social work positions through the VA, but it’s working with those who are homeless that’s been her true calling. Perry has developed the Housing and Urban Development and Veterans Affairs Supportive Housing (HUD-VASH) program in her Grand Rapids, MI, community and carries a caseload of 35 veterans. She also volunteers her time working with the homeless community by serving on district committees. Perry also continues to work with her local church, providing outreach services to local missions. The thought of becoming a social worker first entered Richard Spratt’s mind as a high school student when a sociology teacher sparked his interest. Following his high school years, he was drafted into the military, but that social work interest was rekindled when a fellow solider, who was taking social work correspondence classes, shared some of what he was learning. Today Spratt is a supervisor for the Hennepin County Human Services and Public Health Department in Minnesota. He also teaches at the School of Social Work at Augsburg College, believing in the importance of giving back by helping future members of the field.